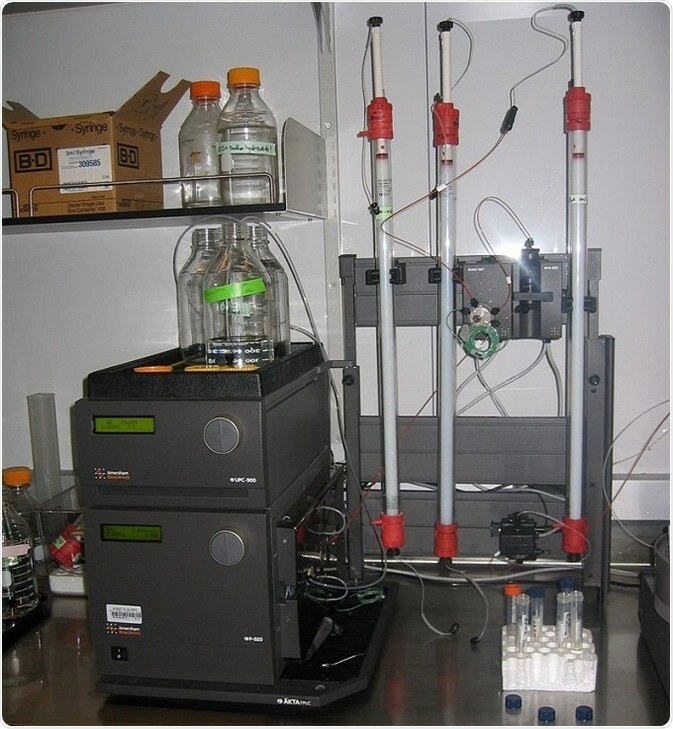 Fast protein liquid chromatography (FPLC) is, as the term implies, an effective (fast) liquid chromatography technique for the separation of protein molecules. The term also implies that the mobile phase is a liquid; the stationary phase is often a resin. In this method, a pump is used to maintain the flow of the mobile phase at the desired rate. The composition of the eluent is varied by using different proportions of the fluids that make up the eluent. The conditions of separation are maintained in such a way that when the composition of the eluent changes there is a differential adsorption to the stationary phase of the components of the sample. Optimization of this technique leads to the separation of proteins and peptides in the sample. Keeping these concepts in mind, Pharmacia developed the technique of fast protein liquid chromatography in 1982 to provide a method for the separation of biomolecules. The goal of FPLC is purification of a biomolecule (biopolymer, protein, peptide), the size of which may be several thousand Daltons. The sample volume can range from about 100 ml to several liters. As is common with biomolecules, the eluent is a buffer, in turn often made up of two or more buffers. It is also important the eluent components used are biocompatible and do not react with the substance being purified (examples would be Teflon, titanium, glass). The whole FLP chromatography apparatus is often used in a cold room (or at 4°C) so that structure of the protein being purified is not disturbed. As the pressures used are often in the range of a few bars, the method is sometimes referred to as medium-pressure liquid chromatography; and as this is used for purifying biomolecules, the technique also referred to as biopurification or biochromatography. The stationary phase in FPLC is often a resin. Ion exchange, gel filtration, reversed phase, and affinity chromatography are the common modes used in the FPLC process, and there is also a wide choice of resins available for each of these modes. Sometimes, a combination of these modes is used. The first step in the isolation of a protein from a crude extract is often affinity chromatography. This may then be subject to ion-exchange chromatography to remove contaminants. When it is not possible to obtain a pure protein in two step a third step such as ion-change chromatography may also be used to obtain the final pure product. The buffer used as the mobile phase and the type of resin used form a pair. Additionally and as already mentioned, the buffer itself may be a combination buffer, made up of a running buffer and an elution buffer. When the running buffer flows through a chromatographic column, the sample is applied by a sample pump. As the sample flows through the column, the protein of interest is selectively adsorbed by the resin; the other components in the sample simply flow out of the system. The buffer gradient is then changed by introducing the elution buffer with the help of buffer-blending valves. As more and more of the elution buffer flows into the chromatographic column, the protein of interest dissociates from the resin and flows out with the eluent buffer. The presence of the protein in the eluent is confirmed by a detector that measures the protein concentration. Body fluids such as plasma, urine, and cerebrospinal fluids contain a variety of proteins and peptides, and FPLC has proven to be a fast and reliable technique for a study of markers in these fluids. Lipoprotein profile, for example, can be obtained through FPLC. Profiling of proteins in cerebrospinal fluids has been helpful in detecting changes in the constitution of the fluid in disease states. As polynucleotides can be also studied by FPLC, the technique has been used for the rapid purification of RNA and plasmid DNA. FPLC protein profiling has also been used in the purification of animal venoms as well as in the diagnosis of beta-thalassemia. Its use in identifying microvariability within a single protein is also seen to have clinical importance. FPLC has been used fairly extensively in analyzing the nitrogenous constituents of beer, which are believed to play a role in foam stability. Purification of porphobilinogen deaminase from human erythrocytes, as well as purification of antibodies and vaccines for various purposes, has been facilitated by the use of FPLC.